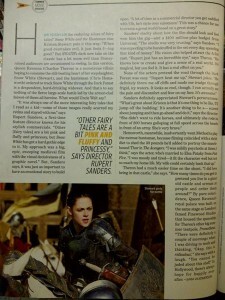 How to explain the enduring allure of fairy tales, Snow White and the Huntsman' star, Kristen Stewart puts it this way "When good overtakes evil, it just feels f*cking good." Sanders definitely appreciated Stewart's perseverance, "What's great about Kristen is that is that its one thing to be like, 'I'll jump off a building'. Its another thing to s--- scared about jumping and then go ahead and do it', says the director. "She didn't want to ride horses and ultimately she rode in front of 200 horses galloping at full speed across the beach in front of an army. She's very brave."